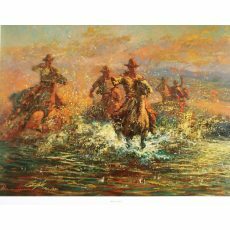 Though Bill L. Hill was born and reared in the western environment he paints, his talent took him far beyond the "cowboy artist" genre. 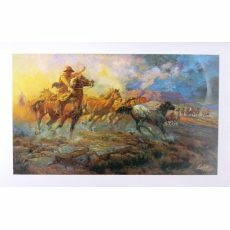 His "Full Spectrum Painting" coupled with a strong impressionistic style suitably rises to the magnitude of the western theme. 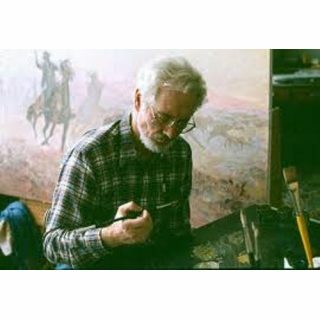 More than sixty years of devotion and drive toward excellence in his art may explain, in part, what one finds in his work. The light, color, energy, and spirit lifts, brightens, and sparks happily the human soul. One should not wonder that Bill's art is filled with the sacred, the profane, the unusual, the common, the tragic, and the humorous. He is always reverent, creating a sense of delight in humanity and nature. 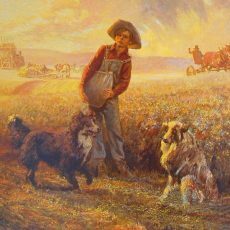 Power, passion, and purpose leap from his canvases and speak to the heart and mind and quickens one's nostalgia for things of the past. Inspired by work, play, fatigue, sympathy, and pain, Hill's explosion of colors creates and imaginative panoramic view of the western epic.